Ratsumies Peter Halket Mashonamaasta (published in 1909 in Finland), by Olive Schreiner (1855–1920), translated by Aino Malmberg (1865–1933). 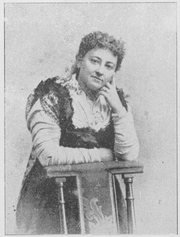 Olive Schreiner was born to a German father and an English mother, missionaries in South Africa. Despite their strict religion, their household was erratic, and Olive's education rested primarily on her mother and her own reading. When her older brother was appointed headmaster at a school in Cradock, she went to live with him and received a formal education for the first time. She then worked as a governess for about 8 years. Olive studied the works of a wide range of prominent Victorian intellectuals, wrote a number of her own short stories, and began to develop her own social ideas. During this time, Olive saved enough to buy herself passage to England, where she hoped to study medicine. However, she had to abandon this plan due to her own poor health. She published her first book, The Story of an African Farm, in 1883, which launched her career as a novelist and social activist. In 1894, she married Samuel Cronwright, a politically active farmer in South Africa, who shared her views. Her works included much political and social criticism, and some were published under the pseudonym "Ralph Iron." She opposed Cecil Rhodes' colonialist policies in Africa as well as England's involvement in the Boer War. She also supported the women's suffrage movement and took a pacifistic stance against World War I.
Olive Schreiner is currently considered a "single author." If one or more works are by a distinct, homonymous authors, go ahead and split the author. Olive Schreiner is composed of 7 names. You can examine and separate out names.